"Here's the fact," Conway said on Jan. 27, 2017. "The No. 1 source of income into Mexico are Mexicans working here and sending the money back." As Politifact points out, this is false. Actually, it's grossly false. According to federal data, the United States in 2015 imported Mexican goods totaling $295 billion. That pot of money is more than 10 times bigger than the amount of remittances. The biggest category of Mexican exports to the United States -- auto vehicles and parts -- was by itself north of $100 billion in 2015, according to the Census Bureau. In addition, foreign direct investment by the United States totaled $28 billion in 2015 -- a bit higher than the projected remittances for 2016 and clearly higher than the total of remittances for 2015, which was $24.8 billion. Foreign direct investment is defined as "investment from one country into another, normally by companies rather than governments, that involves establishing operations or acquiring tangible assets, including stakes in other businesses." If you're inclined to think Mexico has a tiny economy based on low-wage workers coming illegally into the United States, this falsehood is clearly appealing. I wrote my first post of this blog 11 years ago today. The second post, on the same day, was about how the Padres signed Mike Piazza. I wrote that I doubted he would could even 20 homers so I also have the distinction of making an inaccurate prediction on my first day of blogging. Piazza hit 22 HRs in 2006. The Mexican peso started falling after Donald Trump's election but has rebounded for three days. In fact, investors are starting to look at the peso as a good bet. The idea is that the United States and Mexico will eventually get things sorted out and that the foundation of the Mexican economy is solid. The flip side of this is the notion that this instability will undermine economic growth, which in turn will hurt the currency. Statements by Trump or Enrique Peña Nieto (not to mention Carlos Slim) make the peso bounce around. Last year the peso moved according to whether Trump seemed to be losing in debates. The big question is whether long-term stability is even possible with Trump, who changes his mind constantly. Peruvian President Pedro Pablo Kuczynski's honeymoon may be ending. His approval has dropped sharply down to 35%. I had thought he was one of the more interesting new regional voices in Latin America, and right now he's one of the presidents vocally supporting Mexico against Donald Trump, and from the right no less. But Peru is tough on presidents--approval is consistently low. You could quite reasonable argue that problems at home would make it natural for PPK to focus more of his attention abroad. But that can only go so far. We've already seen how domestic problems in Brazil and Venezuela greater shrunk their international presence. First, Mexican unity. He repeats this over and over. Trump looks for weakness in negotiation, and so this must be avoided. Between the lines, don't head over in AMLO's political direction. Instead, let Slim help the government craft a response. Second, if Mexico speaks Trump's language, it can benefit. Trump wants to invest in things like infrastructure that Mexico can contribute to and benefit from. He mentions technology a number of times. I assume Slim figures the worst elements of Trump's ideas (like the 20% tariff) can be negotiated. Third, there's a lot of ego stroking. You should go read Trump's books (he even has one that he holds up), he's such a great negotiator. Trump has an ego that the rest of us truly cannot comprehend (even in academia!) and Slim fully grasps it. If you tell Trump how much you love him, he'll concede more. 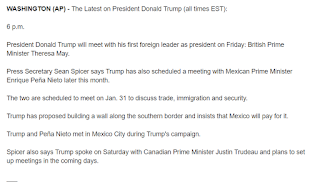 It's not coincidental that Slim's press conference and a conciliatory Trump-EPN phone call occurred on the same day. This is becoming a billionaire's game. During his campaign, Donald Trump kept saying Mexico would pay for his wall. Enrique Peña Nieto said he would not pay for it--he repeated that after their odd visit last August. Former President Vicente Fox also did so in more colorful language. This was all last year. 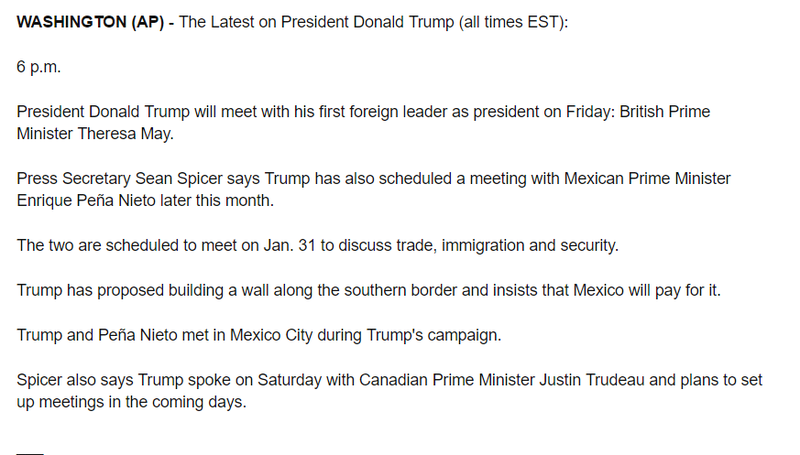 Fast forward to January 2017 and we have Trump inviting EPN to meet, then today tweeting that maybe they should call off the meeting because EPN said in a televised statement that he would not pay for the wall. In other words, exactly nothing had changed in the past year, but Trump suddenly said the meeting was pointless if EPN wasn't going to agree to pay. (And incidentally, if you haven't seen Vicente Fox's latest tweet, it has a memorable hashtag. That makes no sense to the normal person. One has to assume that Trump is employing some sort of negotiating tactic. I don't know what it might be. Doing deals in business is not like working with countries, and it certainly bears no resemblance to working the complicated U.S.-Mexico relationship, which affects many Americans and major cities on the border. It actually works out well for EPN, who can now claim he stood up for Mexico and did not have to deal with Trump's blustering in person. The last thing he needed was Trump figuring out a way to embarrass him, which is something Trump likes doing. Trump's now talking about making Mexico pay through some sort of tariff. What he clearly does not understand is that punishing Mexico economically will increase undocumented immigration, if a wall is there or not. It will hurt the many Americans who have ties of some sort with Mexico, and it will hurt border cities. It will hurt consumers, who will see prices go up. Poor relations with Mexico probably resonate with his base. But they create unnecessary problems in the United States. The history of U.S.-Latin American relations has often been one of the United States creating self-inflicted wounds. Unfortunately that is the path we seem to be going down now. Update: He just announced a 20% tariff on Mexican goods, so we're about to enter a trade war with an ally. Everyone loses. I'm on Charlotte's WCCB TV (right outside my building on campus) talking briefly about Donald Trump's executive order (access the text of it here). The snippet they took was about DACA, which was not mentioned. The upshot is that the order clearly has big ambitions but is short on details. For the time being, people will likely wait to see what happens. For people protected by DACA, it's scary because Trump has gone back and forth on this, from mass deportation to "we're going to focus on more dangerous undocumented immigrants." After the election, we were constantly speculating about Trump's intentions. Now that he's president and actually has a written order made public, we still have to speculate because he seems to be unwilling to be specific. Here is the text of the new Executive Order on immigration (h/t Adam Isacson). The "recent surge" language is highly misleading, crime has not suddenly become a problem in border cities, and the vast majority of immigrants pose no danger at all. But we're in an era of alternative facts. Among the many serious problems with the order is that it calls for more detention facilities, which are a human rights disaster, and 5,000 more Border Patrol agents. Plus, without more federal immigration judges, you cannot possibly process the people you round up--the order says to "assign" them but not to hire more. There is mention of hiring "personnel" I don't know who that encompasses. The IMF says that Latin America will grow slightly less in 2017 than forecast in October. The new numbers are clearly tied to the Trump presidency. First, Mexico and Central America's forecasts are lower than South America because their economies are based in large part on trade agreements with the United States. Trump has threatened those agreements, of course, but it's very unpredictable. Second, Mexico is not only lower, but it's supposed to drop to 1.7% in 2017 from 2.2% in 2016. That's pure Trump. 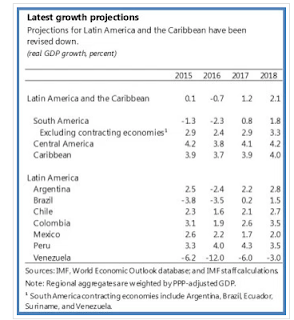 Third, Colombia is expected to grow quickly. This is why it's so critical for the Trump administration to support the Peace Agreement, which is in doubt. Some--how much I don't know--of that growth could be in jeopardy. Fourth, and this has nothing to do with Trump, is that Venezuela is expected to contract but much less than it has been. I suppose this is related to the expectation of higher oil prices. I wonder whether this "lesser contraction" will be enough to take pressure off the government. Latin America Goes Global got a scoop on soon-to-be Secretary of State Rex Tillerson's answers to questions about Latin America policy. Overall, I think it's measured, or at least nothing immediately stands out as extreme, even with regard to Venezuela. The main issue that's off key is Colombia. If confirmed, I would make every effort to continue our close cooperation with the Colombian government, holding them to their commitments to rein in drug production and trafficking. I would also seek to review the details of Colombia’s recent peace agreement, and determine the extent to which the United States should continue to support it. This is unwise. The Colombian government worked long and hard to pass an agreement, which is now being implemented. It is ridiculous even to suggest the possibility that the United States would cease to support it. I would in fact be surprised if the Trump administration cared enough about the agreement to criticize it. There is no payoff, internationally or domestically. If Trump feels some need to be critical, we can only hope that he does his normal blustering via Twitter then gets back to his normal practice of bragging about how he won the election. The Trump administration's first action related to Latin America is to announce that the president will meet with the Prime Minister of Mexico. There is of course no such thing. We can all hope that Press Secretary Sean Spicer learns on the job. Update: it's been reported elsewhere, but here is the screenshot of the link I used before it was corrected. In Understanding Latin American Politics: The Podcast, I talk with Ryan Carlin, who is Associate Professor of Political Science at Georgia State University. The topics are accountability, satisfaction with democracy, and trust in Latin America. Even sorting out how people define “democracy” can be problematic. I have a new post up at Latin America Goes Global. What I'm trying to do is push back against the notion that we're seeing the left being swept out and the right being swept into Latin America. Ideology isn't gone, but this isn't the 1990s again. There are counter-pressures against both the left and the right, so it's not the simple orthodoxy that we often hear. Latin America Goes Global has a new section called "Just the Facts." The latest post provides bios of the people currently working for the Trump transition and those rumored to be under consideration for a position in the new administration. We're still in the speculation phase, and even though tomorrow is inauguration we won't know the Latin America positions right away. One key position is Assistant Secretary of State for Western Hemisphere Affairs. In the George W. Bush-Barack Obama transition, Tom Shannon (who as I've mentioned could become Secretary of State!) stayed until the end of Obama's first year, so there was continuity. The current Assistant Secretary is Mari Carmen Aponte, but Trump has shown that he does not want Obama's political appointees to stick around. If he follows that, then the position will be open. I think that starting tomorrow there will be a lot of empty desks. The National Security Council Senior Director for Western Hemisphere Affairs is another critical position. Mark Feierstein is out and so it will be empty. The list in the post above is a useful place to start. Benjamin Lessing has a really interesting post at The Monkey Cage about the influence of Brazilian gang members in prison. Two largest gangs, the PCC and the CV, are fighting a war. I think two main points are particularly important. First, like in El Salvador the Cold War matters, though in a different manner. The CV originated with incarceration practices by the Brazilian dictatorship, which put leftist militants and common criminals together. The latter learned organizational techniques from the former. Second, mano dura policies that sound good because you're "getting tough" often make the problem worse. The PCC is a unified group built from disparate gangs that came together to protect themselves from the state. Mass incarceration led to imprisoned gang leaders wielding considerable power over the outside world. The CV originally spread when officials unwisely dispersed its leaders among Rio’s prisons. PCC leaders have also been transferred to or arrested in other states, where they invariably founded local chapters. Conversely, some local copycat prison gangs were founded by inmates who spent time in PCC-controlled prisons in São Paulo. Once sophisticated gangs emerge within a state’s prison system, they generally begin to organize drug turf in that state’s urban areas. This suggests that the PCC’s and the CV’s organizational know-how constitutes a replicable technology, one that gives them a game-changing advantage over local incumbent gangs. Eventually, you end up where El Salvador went, which is to desperately forge uneasy truces just to bring down the violence. Solving the underlying problem of marginality is a much bigger problem. Every so often, I do some links to posts on Latin American politics in case you're not familiar with people blogging out there. At Central American Politics, Mike Allison notes how Salvadorans are not happy with their government's performance, but at least there is a bit of silver lining. At Caracas Chronicles, Quico Toro looks at Nicolás Maduro's annual accountability speech. He's a wee bit critical. At Latin America Goes Global, Chris Sabatini vents his spleen about how supposedly anti-populists welcome U.S. populism. At AULA Blog, Carlos Malamud looks at the electoral calendar for 2017. Boz muses about possible Russian interference in Latin America. I'm not quite ready to make that leap yet but I'll keep an open mind. Honduras Culture & Politics has a post on drugs and corruption in Honduras. In many ways the far left and far right have a common framework when examining U.S.-Latin American relations. Most importantly it involves living firmly and stubbornly in the past and maintaining a largely inaccurate view of relations. Case in point this article in Jacobin about Trump and Latin America. Among other things, it argues that Trump will push hard for free trade agreements, which is odd to say the least, although later in the article it contradicts itself by saying the opposite. It says Obama's drug policy has been unchanged since George W. Bush, which is not true--you can certainly criticize it, but it's not the same. It calls Obama's opening to Cuba "tentative," which is bizarre. It believes the US government and the IMF have never left the 1990s with regard to economic policy. It misunderstands US sanctions against Venezuela (which are part of a good cop/bad cop strategy rather than "hardening"). Finally, China is somehow going to "thwart" U.S. hegemony. I don't even know how that's supposed to work. I read Garrard Conley's Boy Erased: A Memoir (2016) and it packs a punch. It's a memoir of the gay son of a Missionary Baptist preacher in small town Arkansas and how he is sent to therapy to "cure" him. He hates the therapy, which ultimately robs him of his faith, and he struggles both with his own identity and sexuality as well as his relationship with his parents. His father in particular simply cannot have a gay son--it would actually hurt his standing in his own church because how can you claim to fight Satan if you accept that? It's a sad but engrossing book. The therapy is simply psychological abuse. You must've had problems in your family to be gay and you're in the grip of Satan. Stuff all your real feelings down and act like everyone else, no matter how painful it is. A lot of the book examines how we show things on the surface and hide so much else, and in fact we're often encouraged to do so. And sometimes that leaves scars. 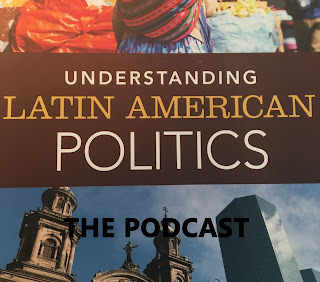 In Episode 19 of Understanding Latin American Politics: The Podcast, I talk with Tom Long, who is Lecturer in International Relations at the University of Reading and author of Latin America Confronts the United States: Asymmetry and Influence (which I reviewed back in August 2016). He also just published an article in the special issue of The Latin Americanist that just came out. We discuss how Latin American foreign policy tends to get ignored, the balance between studying individual policy makers and structural conditions, and U.S. influence in Latin America. And with inauguration only a week away, we finish by talking about Donald Trump. Yesterday's news that the Obama administration ended the "wet foot, dry foot" immigration policy coincided nicely with the publication of an academic article I wrote for a special issue of The Latin Americanist. Go check them all out. This paper challenges the assumption about U.S. loss of influence in Latin America, arguing that it ignores soft power and the concrete advances it fostered. The Obama administration represented a policy shift that, though gradual, has paved the way to achieve stated policy goals. Using the case of Cuba, it will argue that the United States is increasingly its influence in ways that are typically not taken into consideration. Even the single case of Cuba has regional implications. This argument won't surprise readers of this blog. I've been arguing for some time that the "wet foot, dry foot" policy for Cuban migrants was certainly under discussion and would be changed unexpectedly and quickly. That time has now come, right before Trump takes office. Effective immediately. This was a needed step because the policy creates a strong incentive for Cubans to emigrate, sometimes taking enormous risks, and is a Cold War policy that no longer makes sense. The people leaving Cuba are not doing so for political reasons. The much better policy is to help the Cuban economy so that people are less like to want to leave. Even many hardline anti-Castro members of Congress are skeptical of the policy these days because it was intended to help Cubans escape repression, whereas these days they want to travel back and forth and don't suffer repression for doing so. Update: here is the statement from President Obama. Alan McPherson has written a clear, succinct, and engaging account of the history of U.S. intervention in Latin America and the Caribbean, which of course is a topic with no shortage of case studies. It is a synthesis aimed at classroom use, and will work admirably in that regard. McPherson lays out what he calls the “Five C’s” as a way to orient the reader. These are 1) causes; 2) consequences; 3) contestation; 4) collaboration; and 5) context. They’re more usefully viewed as guideposts rather than a framework, intended as categories for the reader to better grasp the narrative. For instructors, they will provide a useful way to help students understand causation and make comparisons across cases. If you are teaching U.S.-Latin American Relations (or if you're an interested student reading this) then give it a look. My dad has a post about abortion in El Salvador, which has very strict laws. Two key points he makes are that the debate (and law) is rife with hypocrisy, and that religiosity rather than religion per se determines how much the Catholic Church (or any religious denomination globally) pushes for anti-abortion laws. I should point out, however, that to its credit El Salvador does allow access to contraception and the PRB World Population Data Sheet shows that 68 percent of married women aged 15-49 are using some form of modern contraception--exactly the same percentage as in the U.S.
Contraception gets too little attention in debates about abortion. For example, as Republicans in the United States vote to defund Planned Parenthood, they are also making it more difficult for women to get access to contraception, this increasing the chances of unwanted pregnancies. Same goes for repealing the Affordable Care Act, which includes a birth control mandate. The bottom line is that if you want fewer abortions, you need to provide broad access to contraception. I saw a post at InsightCrime about a public opinion poll in Mexico. Here is the original link to the poll. It was conducted by the Centro de Estudios Sociales y de Opinión Pública, which is part of the Cámara de Diputados. I did not know that public opinion polls were being run by the legislature. Normally politicians do not want to admit they are making decisions based on a snapshot of public opinion, even though they might be greedily looking up polls or running them on their own through a paid firm. An obvious question is impartiality: is it run by professionals without political pressure? In this poll, the results are not flattering. Many Mexicans think authorities are part of the crime problem, a majority think autodefensas are OK (this should make you shudder if you know anything about Colombia), they have high confidence in the navy (?) but, fortunately, recognize that having more guns is not the answer because it will increase crime. Plenty of food for thought for legislators. Henrique Capriles has called for a protest on January 23 across Venezuela. The intent is to push for elections. They hope for a new slew of elections based on the notion that Nicolás Maduro has abandoned his post. Given how desperate the regime is to stay in power, this seems wildly unlikely. Interestingly, of course now if a recall referendum were held and triumphed, then Tareck El Aissami--who has all kinds of baggage, including drug trafficking--would become president. Now, perhaps that's not functionally worse than Maduro, but it's definitely not an improvement. As I wrote in September, there is ample evidence to show that Venezuelans value democracy and want a democratic conclusion to the crisis. What this also means, though, is the government's anti-democratic responses to opposition have not been challenged. Dialogue went nowhere. Protests come and protests go. None of them have developed into something larger. The opposition keeps trying, but is still divided. Therefore the country seems mostly to be staggering onward toward the April 2018 presidential elections, which if held will be won by the opposition. Over the past year or so, Latin American leftists have been working on a document entitled, "Consenso de Nuestra América." According to Granma, Daniel Ortega's inauguration was an opportunity to advance it. Apparently in a few days a document will be submitted to the Foro de Sâo Paulo, a conference of leftist parties and organizations. The idea is to present a united response to the setbacks the left has suffered over the past few years, but especially last year. I was unable to find any excerpts, so I don't know what will be in it, but I will be interested to see whether it is just platitudes or whether it addresses real challenges. Will it be a platform or blueprint that parties can use? Latin America now versus the 1990s is very different, and leftists must address the skepticism that has settled in after governments have been in power for a long time. Matthew Carr's The Devils of Cardona is a murder mystery set in 1584 Spain. A priest has been murdered, then others are killed, and the question is whether moriscos, or Muslims forced to convert to Catholicism, are responsible. The Inquisition and its ideals are thus a key part of the story. It is a complicated--at times almost overly complicated--plot. It's a good story, though not a great one. The narrative of the lies behind what everyone does is compelling--the priests, the Inquisitors, the investigators, the seemingly pious women, the forced converts, everyone hides behind facades. And the irrational fear of Muslims is clearly intended to speak to the post-9/11 era as well. The protagonist, the judge Bernardo de Mendoza, is a well-rounded character, with enough contradictions to keep him interesting. The story has a few too many TV-ish rescues, but it's worth it. If Carr writes another Mendoza book, I'd buy it. The Obama administration has deported more people (about 2.7 million) than any other president in U.S. history. See my recent post on Obama's problematic immigration record. We have a serious refugee problem on the border, which was not the case when Obama took office. We're seeing fewer single men and Mexicans, and more families and Central Americans. We should start calling this a refugee crisis. Interior enforcement has finally started to differentiate between people who pose a public threat versus those who for any number of reasons deserve humanitarian consideration. This is one of the changes that will be vulnerable under the Trump administration. Set aside the absurd debate over walls, fences, barriers, and who will pay for them. The critical problem is the degree to which the Trump administration views immigrants as a threat bloc, or is able to understand (or care) about the lived reality of the people they are rounding up. It took a while, but Obama was moving in that direction. There isn't much good to say about Henry Kissinger, especially with regard to Latin America. Now Zach Dorfman, Senior Fellow at the Carnegie Council for Ethics in International Affairs, found new documents from 1979 detailing how Kissinger met with Chilean Foreign Minister Hernan Cubillos. His goal was to help the dictatorship withstand pressure from the Carter administration, which wanted extradition of the three masterminds of the Orlando Letelier/Ronni Moffitt murders. Kissinger is thus aiding a dictatorship that had committed an act of terrorism in the United States, trying to thwart the Justice Department. That's his legacy. Go read the whole thing, which also has a very good discussion of the domestic politics behind this conversation. An undertone was the possibility that Kissinger would become Secretary of State again, and both were talking openly about the 1980 election (which Kissinger got completely wrong). Who Thinks Mexico Will Pay For Trump's Wall? Over and over, Donald Trump told crowds Mexico would pay for a border wall. It was a call and response thing at rallies. He even published an extortion plan that would last three days. Now he changed his mind. "Democrats may well find themselves in the position to shut down all of government to stop the buildout of a wall, or of a barrier, or of a fence," Messer said. Even better, he says Mexico is going to pay later! I'll gladly pay you Tuesday for a wall today. Well, or maybe just a barrier, whatever that exactly is. And yet, despite this heightened politicized backlash, the region scored enormous achievements in the struggle for LGBT+ rights. It held the gayest Olympic games in history, produced the first gay-inclusive peace agreement in the world, continued to lead the Global South in creating LGBT chambers of commerce, saw lesbian and transgender people running for office, and witnessed episodes in which the rights of non-traditional queer communities received some recognition. For these reasons, the top story of 2016 is not the unprecedented politicized backlash but rather the persistence of progress even in the face of these growing challenges. Don’t get me wrong, the politicization of the reaction against LGBT rights was a huge story. It’s just not the top one. Indeed, often the heightened backlash occurs precisely because there has been so much progress (I even think of my home state of North Carolina). But progress continues. One thing that strikes me about the new stories is that there is no consistent correlation between ruling ideology and progress. Leftists and the center-right are all over the map (I think it's safe to say the far right is consistently anti-LGBT). Tom Shannon as Secretary of State? H/t Orlando Pérez on Twitter, citing Diplopundit. We’ve asked the State Department who will be designated as Acting Secretary of State in the event that Mr. Tillerson does not get confirmation immediately after inauguration day. The State Department directed us to Executive Order 13251 of December 28, 2001 which designates the order of succession for the agency. Based on this E.O., if the Senate drags the confirmation of Mr. Tillerson for months, the State Department will have the Under Secretary for Political Affairs, Thomas A. Shannon, Jr. as Acting Secretary of State until such time when the Senate can confirm the 69th Secretary of State. In the event that Ambassador Shannon is not able to, the next in line is the Under Secretary for Management, Patrick F. Kennedy. For those of you who follow Latin America, you know that Tom Shannon is an experienced and respected diplomat who worked both for George W. Bush and Barack Obama. In recent times he's been the administration liaison with Venezuela--I most recently wrote about this in November. The odd thing, then, is that the potential acting Secretary of State is very well qualified but (almost precisely because he is so well qualified as a diplomat) has a mindset that is wholly different from the president he would serve. I have no idea how likely this entire scenario is, but he'd be a good choice, especially for relations with Latin America. The year is only four days old, but already looks to be a bad one for Mexico, and Donald Trump is in the middle of it. --Deregulation has pushed gas prices up, which has prompted protests. Prices could go up by 20% over January. The timing seems terrible, but speculation is that the government wanted an influx of cash in anticipation of the Trump administration. --The peso dropped to its lowest point in seven weeks. On the flip side, concern about Trump has made remittances soar, which at least is positive in the short term but not sustainable. We'll have to see after January 20 how that changes. Enrique Peña Nieto has a 29% approval rating, with 65% disapproval. That's already bad but watch it go lower. From Hugo Pérez Hernáiz, a reminder that 2017 may be the worst year for truth in my lifetime. A Chavismo argument now is that not accepting conspiracy theories about Venezuela is a sign that we are in a post-truth era. Since all of the conspiracies are obviously true, not believing them shows you are the victim of fake news. Moreover, this is obvious. So perhaps when evidence shows the Venezuelan government mortgaged CITGO to the Russians, but Nicolás Maduro doesn't mention it, then it didn't happen. Saying it happened is a sign that you are post-truth. As Donald Trump said in one of the debates, "Wrong." And if the Venezuelan government announces it's going to stop accepting the 100 Bolívar bill, causes panic, then says it'll accept it for a while longer? Well, that was a conspiracy too. Obviously! Don't believe that? THEN HEY LOOK I'M PLAYING SALSA TO A COUPLE OF PEOPLE! The Minister of Economy and Planning, Ricardo Cabrisas, said the financial problems are motivated by the non-compliance of exports income, the difficulty of several trading partners caused by low oil prices and contraction in the fuel imports. That income just didn't comply! Stupid non-compliant income. Of course, what this mostly means is that Venezuela is collapsing and cannot send dollars or oil. That state of affairs will not be changing anytime soon. Raúl Castro says Cuba can achieve 2% growth in 2017, which leads us to the next great quote. To achieve those targets three premises will have to be carried out: guarantee exports and their opportune collection, increase national production to substitute imports, reduce all dispensable expenses and use available resources rationally and efficiently. Don't expect "opportune collection" out of Venezuela. And "reduce all dispensable expenses" is a really scary phrase coming from the government, because it can mean things like "eliminate all caloric intake over the minimum." Ben Lindbergh and Sam Miller (baseball writers who up to basically yesterday co-hosted the podcast Effectively Wild) wrote a very entertaining book about trying to use sabermetrics to run a baseball team. In The Only Rule Is It Has To Work (2016) they chronicle how they got wide latitude to run an independent league team, the Sonoma Stompers, using data to make decisions. The book is a great read because they're smart, funny, and self-aware. By the last I mean they know and admit when their decisions aren't working, and try to honestly figure out why. They also have a keen eye for the people in the story--and there are so many I often lost track, but it doesn't really matter anyhow. Indy leagues are funky, and they capture the funkiness. Even Jose Canseco makes an appearance. What I got out of the book is that no matter how much you might want to, you cannot take the people out of the analysis. Data can point you in the right direction, and you should use it to do so, but humanity constantly gets in the way. Ben and Sam try to measure clubhouse "chemistry" but ultimately can't. What's it mean for a guy to be a "cancer" in the clubhouse? They don't know beyond what people tell them, all of which is biased and self-serving. They get rid of people based on data, but it's very hard to ever know whether those decisions were better than not doing them. Since this was written earlier this year, it's interesting how the World Series validated them to an extent. In the book they were frustrated about use of closers, where managers resisted using them before the ninth inning. As they learned, "the close is the closer because he's the closer." They had to fire a manager in part to break through that. Yet in the World Series we famously saw top relievers like Andrew Miller coming in very early. Data says it works, but getting that through to baseball players who go from the gut is tough. But, as they note various times, they also had to go with the gut. Baseball games move fast and you rely on instincts because you don't really have any other choice. It's fun to read about two guys trying to balance that.